I don’t usually post anything on Saturdays, but you all have to go read Jeanne Carpenter’s latest. Right now! I’m pretty much at the end of promoting my book via readings – one can only milk this kind of thing for so long – but I really had to do some Wisconsin events before calling it a day. * I mean c’mon, Wisconsin… those people love their cheese. It means a lot to me when Wisconsin like me book. Because really, I’m a Californian. Being a California cheese person among Wisconsin cheese people is like being a Californian in Oregon. At any gathering, someone in the Wisconsin dairy crowd will mock the “happy” California cows, a Californian will bring up the fact that California leads the nation in milk production, and it can get all West Side Story. Can’t we all just get along? One person who I always get along with is Jeanne Carpenter of Cheese Underground and a million other cheese projects. She’s one of my favorite cheese people. How could she not be when she referred to me as the “Barbara Mandrell of the cheese counter”? ** When I arrived at Fromagination for my reading she gave me an autographed copy of the Wisconsin Cheesemaker calendar. At the Cheddar Maker roundtable I had complained that we had been trying to get everyone’s picture signed at Rainbow but because we actively use the calendar, it had already gotten trashed. That’s the kind of person she is! My reading was full of friends and friends of friends… worker-owners of Union Cab? Hello! … WMMB acquaintance? Good to see you! … Quince and Apple? Welcome! … Writer friend of my ex’s sister? Great to meet you! My old cheese friend Steven was there too, working the counter. That was really special since I got to find out he worked for a company whose cheese book I mocked during my reading. It’s a small cheese world. Oh Wisconsin, I love you. 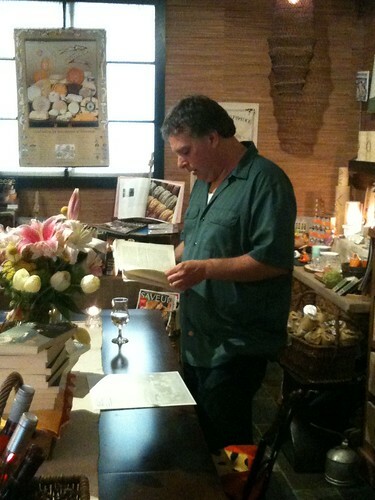 *Just for the record, I’m not seeking out more book events – 40+ is a lot – but I’m still happy to hear offers. I’m deeply sad that I can’t do this year’s Southern Festival of Cheese, for example, so Nashville, I owe you one. And NYC, I wouldn’t turn you down either. **If I have a tombstone someday, this is what I’d like to have on it, please. ***It goes far beyond this – in every state in the union – but the Recall elections are coming. Do the right thing, Wisconsin. 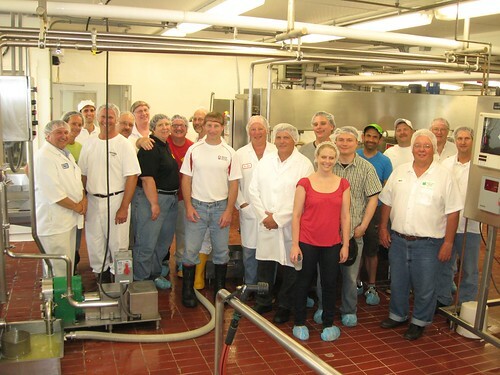 I went to Wisconsin mostly to attend the gathering of cheddar makers hosted by Chris Roelli of Dunbarton Blue fame. I went partly because Chris invited me, partly because I’m doing research for my next book and partly because I am too much of a cheese geek to turn down the opportunity to hang out with an estimated 350 years of cheesemaking experience when I get the chance. This event was actually a follow up to the visit of a bunch of Neal’s Yard folks last year. Someone floated the idea of setting up another gathering where a couple of different vats of cheese — one clothbound, traditional-style Cheddar and one 40-lb block-style Cheddar — would be made so everyone could taste the differences. Slightly different cultures and recipes were used, but the milk was the same. Hopefully, a year from now, I’ll get invited to the tasting event as well! Watching people make cheese is awesome. Making the cheese is hard work. 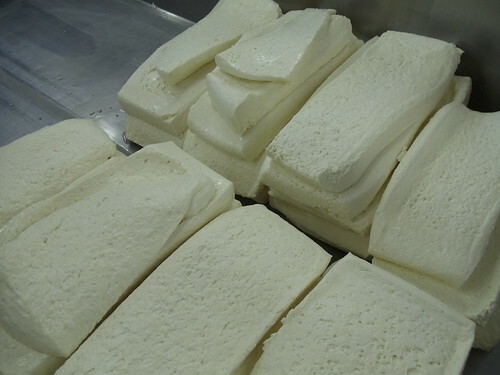 Cheddar is especially hard work if one does it the way it is traditionally done in the US, cutting up the coagulated curds into slabs and piling them on top of each other to press out more whey in order to give the cheese the texture we expect. The cheese room is humid and there is a lot of lifting, cutting, and pushing that needs to be done from non-optimal ergonomic positions. The thing that struck me, being in a room with so much experience and mastery of craft, is how California (my home state) lacks this kind of generation-to-generation passed down, hands-on knowledge. With the passing of Ig Vella recently, this issue is even more acute. Ig was the resource to cheesemaking history in California for many, many people. In Wisconsin, being a third generation cheesemaker isn’t common, but it’s not like finding a raw milk Brie either. Widmer Cellars, Roelli Cheese, Carr Valley, and Hennings Cheese come to mind right away and a google search reveals many more who I’m less familiar with, their cheese not getting out West regularly. Spending a day with cheese people, eating steak sandwiches, drinking New Glarus beer and talking cheese? A pretty great way to spend the day. *Here’s the group shot that I stole from Jeanne Carpenter, a much better journalist than I. She wrote about the event as well so check it out. What I love about this picture is that it’s color coded. 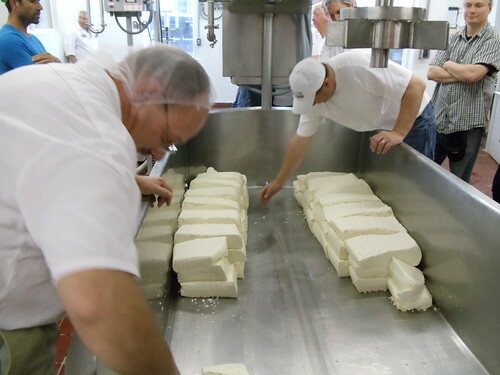 With the exception of Willi Lehner, everyone who makes cheese is wearing white and only the culture sales people, the distributors and the retails are wearing colors.